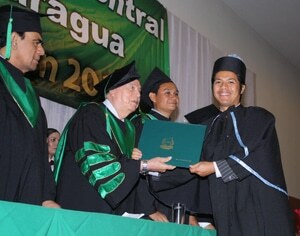 Dr. Bremley Lyngdoh Awarded Doctorate Degree in Sustainable Development from Universidad Central de Nicaragua. 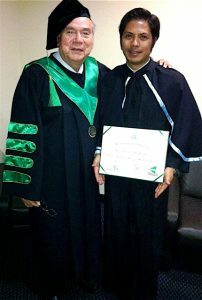 On June 29, 2012, Dr. Bremley Lyngdoh was awarded his PhD in Sustainable Development at the Graduation Ceremony of the Universidad Central de Nicaragua in Managua, Nicaragua. Dr. Lyngdoh was honored by being selected to give a commencement address to the graduating class of 2012. Dr. Lyngdoh is an international expert on the relationship between poverty reduction and environmental sustainability. He is the founder and CEO of Worldview Impact and co-founder of the Global Youth Action Network. In addition to being a Fellow for Intercultural Open University Foundation (IOUF), he is also the co-chair of the Caucus of the United Nations Commission on Sustainable Development Education.